I've noticed that "mid-major" city's like Indianapolis, Nashville, Milwaukee, (among many others) have embraced the start-up culture. This past weekend, I got to work with some great college students at Carlow University in Pittsburg. While I was there I met several other young entrepreneurs and team members of smaller startups. Most agree: we wish we had "found" this culture when we were in high school. 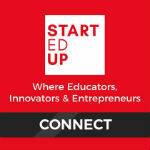 So- how can we foster relationships between the startups and school?